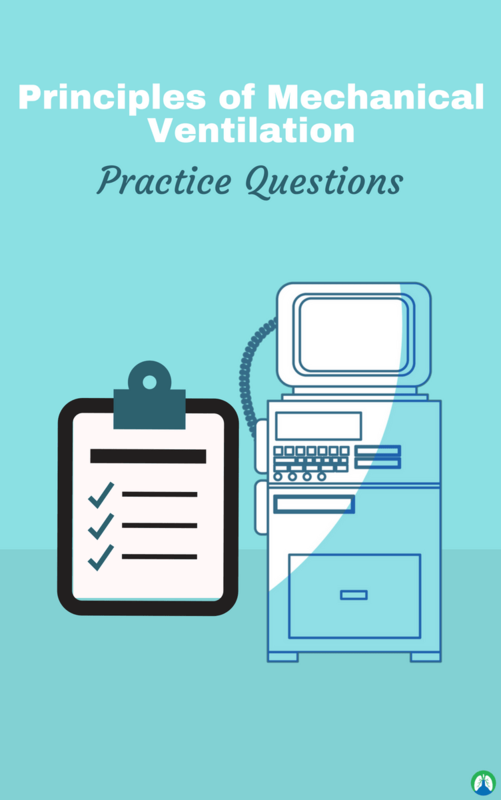 This post contain is a study guide with practice questions that can teach you everything you need to know about the principles of mechanical ventilation. So if that’s what you’re looking for, then you’re in luck! That’s because below we’ve listed out over 100 practice questions and terms to get the gears going in your brain in regards to everything you must know about the principles of mechanical ventilation. The management of the mechanically ventilated patients is crucially important for Respiratory Therapists, obviously, because that’s what we do on a daily basis. This is why it’s so important for you to develop a basic and advanced understanding of the principles involving mechanical ventilation and what better time than to do it now as a Respiratory Therapy student? So let’s go ahead and get started, shall we? It is the movement of air into and out of the alveoli. 2. What are the mechanics of ventilation? Elasticity, compliance, resistance, pressure, and gravity. 3. What is Boyles Law? Air flows from a region of higher pressure to a region of lower pressure. In order to initiate a breath, the must be a drop in alveolar pressure for air to flow into the lungs. 4. What are the indications for mechanical ventilation? Acute or chronic respiratory failure, oxygenation failure, pulmonary or cardiac conditions, sepsis, head injury management, nervous system disorders, and muscular weakness. 5. What is considered respiratory failure? A pH less than 7.25 and a PaCO2 greater than 50. 6. Is mechanical ventilation used for short term or long term care? It is used for both. It can be used in the acute hospital setting, or even to extended care at home. 7. What are the most common uses for mechanical ventilation? It is most commonly used for post-operative patient recovering from anesthesia and medications. 8. What are some more indications for mechanical ventilation in adults? Apnea, Impending respiratory arrest, Acute exacerbation of COPD, Acute severe asthma, Neuromuscular disease, Acute hypoxemic respiratory failure, Heart failure and Cardiogenic shock, Acute brain injury, and Flail chest. 9. Patients who require mechanical ventilation generally have developed what? They usually have developed either ventilatory failure, respiratory failure, or both. 10. What is an external respiration? It is the exchange of oxygen and carbon dioxide between the alveoli and pulmonary capillaries. 11. What is an internal respiration? It is the transfer of oxygen between the blood and the cells at the cellular level. 12. What is transpulmonary pressure? It is the pressure difference between the alveolar space and pleural space. It’s the pressure required to maintain alveolar inflation. 13. What is transrespiratory pressure? It is the pressure difference between the airway opening and body surface. It’s the pressure required to inflate the lungs and airways during positive pressure ventilation. 14. What is transairway pressure? It is the pressure difference between the airway opening and the alveoli. The pressure gradient required to produce airflow in the conductive airways. It’s the pressure that must be generated to overcome airway resistance. 15. What is transthoracic pressure? It is the pressure difference between the alveolar space or lung and the body’s surface. It’s the pressure required to expand or contract lungs and chest wall at the same time. The tendency of a structure to return to its original form after being stretched or acted on by an outside force. 17. What is airway compliance? The relative ease with which the airways distends. 18. What is airway resistance? The measurement of the frictional forces that must be overcome during breathing. 19. How do changes in lung compliance affect the peak pressure measured during inspiration with a mechanical ventilator? Thoracic compliance generally doesn’t change significantly in a ventilated patient; BUT, if a patient actively inhales or exhales during measurement of plateau pressure, the resulting value will be inaccurate. 20. What are some changes in airway conditions that can lead to increased resistance? Airway resistance is increased when an artificial airway (ET tube) is inserted. A smaller internal diameter of tube equals greater resistance to flow. A decrease in the diameter of the airways can also cause airway resistance to increase. These are the results of increased resistance: less pressure is available to expand the alveoli; smaller volume of gas is available for gas exchange; more force must be exerted to maintain adequate gas flow. 21. What is the principle of operation of negative pressure mechanical ventilators? It attempts to mimic the function of the respiratory muscles to allow breathing through normal physiological mechanisms. 22. What is the principle of operation of positive pressure mechanical ventilators? Occurs when a mechanical ventilator is used to deliver air into the patient’s lungs by way of an endotracheal tube or positive pressure mask. 23. What is the principle of operation of high-frequency mechanical ventilators? It uses above-normal ventilating rates with below-normal ventilating volumes to ventilate the patient. 24. What is peak inspiratory pressure? The highest pressure recorded at the end of inspiration. 25. What is the baseline pressure? It is usually zero (or atmospheric), which indicates that no additional pressure is applied at the airway opening during expiration and before inspiration. 26. What is positive end-expiratory pressure (i.e. PEEP)? It occurs when the baseline pressure is higher than zero. When PEEP is set, the ventilator prevents the patient from exhaling to zero. It helps with oxygenation. 27. What is plateau pressure? It is measured after a breath has been delivered to the patient and before exhalation begins. 28. What is the measurement of plateau pressure? It is similar to holding the breath at end of inspiration. At the point of breath holding, the pressures inside the alveoli and mouth are equal (no gas flow). 29. The pressure difference between the alveolus (Palv) and the body surface (Pbs) is called what? It is the ability of a structure to return to its natural shape after stretching. 31. What is the formula used to calculate lung compliance? 32. Name some other terms for airway pressure? Mouth pressure, airway opening pressure, and mask pressure. 33. Intra-alveolar pressure (in relation to atmospheric pressure) at the end of inspiration during a normal quiet breath is approximately what? 34. Which of the following is associated with an increase in airway resistance? Decreasing the flow rate of gas into the airway. 35. Which of the following statements is true regarding negative pressure ventilation? These ventilators mimic normal breathing mechanics. 36. PEEP can best be defined as what? Positive pressure at the end of exhalation on a mechanical ventilator. 38. What are the basic types of power sources used for mechanical ventilators? Electrical or pneumatic (compressed gas). 39. What is the difference in function between positive and negative pressure ventilators? Positive pressure ventilator: gas flows into the lung because the ventilator establishes a pressure gradient by generating a positive pressure at the airway opening. Negative pressure ventilator: generates a negative pressure at the body surface that is transmitted to the pleural space and then to the alveoli. 40 What is the user interface (control panel) on a mechanical ventilator? Located on surface of ventilator and is monitored and set by the Respiratory Therapist. It has various knobs or touch pads for setting components, such as tidal volume, rate, inspiratory time, alarms, and FiO2. Actually, nowadays, most ventilators are touch-screen so there aren’t any knobs. 41. Describe a ventilator’s internal and external pneumatic circuits? It’s a series of tubes that allow gas to flow inside the ventilator and between the ventilator and the patient. 42. What is the difference between a single-circuit and a double-circuit ventilator? Single-circuit ventilators allow the gas to flow directly from its power source to the patient. Double-circuit ventilators require the primary power source to generate a gas flow that compresses a mechanism (bellows/bag in chamber), then the gas in the bellows flows to the patient. 43. What are the components of an external (patient) circuit? 44. What is the function of an externally mounted exhalation valve? During inspiration, the expiratory valve closes so that gas can flow only into the patient’s lungs. 45. What is a commercially available ventilator that is entirely pneumatically powered? 46. What is a ventilator that is totally electrically powered? 47. What type of ventilator delivers pressures below ambient pressure on the body surface and mimics the physiology of normal breathing? 48. Explain the operation of an externally mounted exhalation valve? When ventilator begins inspiratory gas flows through the main inspiratory tube, gas also flows through expiratory valve line to the exhalation valve, closing the valve. During exhalation, the flow from the ventilator stops and the exhalation valve opens. The patient is able to exhale passively through the expiratory port in the exhalation valve. 49. A Drager Evita Infinity V500 ventilator is set to deliver a minute ventilation of 5 L/min. The patient breathes six times in 1 minute and receives a mandatory breath of 500 mL with each breath. The ventilator detects the difference between the actual and the set minute ventilation and adds four more breaths (500 mL each) to make up the difference. Which of the following best describes this type of ventilator? 50. The controls set by the ventilator operator are considered part of the what? 51. The gas-conducting tubes that carry gas from the ventilator to the patient are referred to as what? 52. A ventilator in which the gas that enters the patient’s lungs is also the gas that powers the unit is referred to as what? 53. In a spring-loaded bellows volume-delivery device, the amount of pressure is determined by what? The tightness of the spring. 54. Name two other names for pressure ventilation and volume ventilation? Pressure-controlled breathing: Pressure is unaffected; volume and flow vary with changes in the compliance and resistance. Volume-controlled breathing: Volume and flow remain unchanged, but the pressure varies with changes in lung characteristics. 56. What are the two most commonly used patient-trigger variables? 57. What patient-trigger variable requires the least work of breathing for a patient receiving mechanical ventilation? 58. What are the effects of an inflation hold on inspiratory time? Because of the way the pause functions, the normal cycling mechanism no longer ends the breath, resulting in an increase in the inspiratory time and a reduction in the expiratory time. 59. What is a clinical situation in which expiratory resistance is increased? When a patient has in an ETT and can’t use pursed-lip breathing technique. 60. What are two methods of applying continuous pressure to the airways that can be used to improve oxygenation in patients with refractory hypoxemia? 61. What is airway resistance? It is airflow obstruction in the airways. 62. What is alveolar deadspace? It is Lung volume that is unable to take part in gas exchange because of reduced perfusion. 63. What is alveolar volume? It is the difference between tidal volume and dead space volume. 64. What is anatomical deadspace? It is the volume in the conducting airways that does not take part in gas exchange. 65. What is deadspace ventilation? Basically, it is wasted ventilation; ventilation in excess of perfusion. 66. What is a diffusion defect? Impaired gas exchange across the AC membrane. 67. What is intrapulmonary shunting? 68. What is oxygenation failure? It is the failure of the heart and lungs to provide adequate oxygen to the tissues. 69. What is peak inspiratory pressure? It is the pressure used to deliver a tidal volume by overcoming non-elastic (airway) and elastic resistance (lung parenchyma). 70. What is physiologic deadspace? It is the sum of anatomic and alveolar deadspace. 71. What is the plateau pressure? It is the pressure needed to maintain lung inflation in the absence of airflow. 72. What is refractory hypoxemia? It is low oxygen that does not respond to a moderate to high FiO2. 73. What is ventilatory failure? It is failure of the respiratory system to remove CO2. 74. What is a V/Q mismatch? It is the abnormal distribution of ventilation to perfusion. Raw mean airway resistance. It is the degree of airway obstruction in the airways. 76. When the radius of an airway decreases by half (50%) of its original size, the driving pressure needed to maintain the same airflow must increase by a factor of what? 77. Airway resistance in mechanical ventilator patients is primarily affected by what? The length, size, and patency of airway; and the ET tube and ventilator circuit. Changes inside airway; Changes in the airway wall; and Changes outside the airway. 79. What are the causes of increased airway resistance? COPD (most common), Post-intubation obstruction, Foreign body aspiration (ex. Marble), Infectious process including croup, epiglottitis, and bronchitis. 81. When the airway resistance increases, what happens to the work of breathing? 82. What commonly gets trapped in the ventilator circuit that causes an increased airway resistance? 83. What happens with chronically high airway resistance? Fatigue can set in and affect the respiratory muscles which leads to ventilatory and oxygenation failure. 84. What is ventilatory failure? It is failure of the respiratory system to remove CO2 from the body resulting in an abnormally high PaCO2. 85. What is oxygenation failure? It is failure of the heart and lungs to provide adequate oxygen for metabolic needs. It is severe hypoxemia that does not respond to moderate to high levels of supplemental oxygen. It is caused by: hypoventilation, V/Q mismatch or intrapulmonary shunting. Mechanical ventilation may be needed to minimize work of breathing and provide oxygen support. 86. What is lung compliance? It is the degree of lung expansion per unit pressure change (Basically, it is how easily the lungs expand). 87. Is lung expansion easy with low compliance? No, it would be difficult. 88. What three things does high compliance do to the lungs? (1) Causes incomplete exhalations, (2) causes air trapping, and (3) reduces CO2 elimination. 89. What is refractory hypoxemia? It is a persistent low level of oxygen in the blood that is not responsive to medium to high concentrations of inspired oxygen. The key thing to remember is that it is usually caused by intrapulmonary shunting. 90. What is FRC and what does it stand for? It stands for Functional Residual Capacity. It is the volume of air left in the lungs after a normal, passive exhalation. It is used to evaluate the elasticity of the lungs and chest wall in persons with respiratory illnesses like COPD. 91. What does it mean if a patient has a high compliance? It means that their volume change is larger per unit of pressure change. Basically, it could mean that they have a flabby lung. 92. What is extreme high compliance? Exhalation is often incomplete due to lack of elastic recoil. An example would be emphysema, where the gas exchange process is impaired due to chronic air trapping and destruction of lung tissues. Another example would be a chronic CO2 retainer; someone where high CO2 levels are normal. 93. What is static compliance? It is calculated by dividing the tidal volume by the Plateau Pressure – PEEP. The normal is 40-60 mL/cm H2O. 94. What is dynamic compliance? It is calculated by dividing the tidal volume by the peak inspiratory pressure – PEEP. The normal is 30-40 mL/cm H2O. 95. What are the three types of deadspace ventilation? (1) Anatomic deadspace, (2) alveolar deadspace, and (3) physiologic deadspace. 96. What is anatomic deadspace? It is the volume of air occupying the conducting airways that does not take part in gas exchange. It is estimated to be at 1 mL/lb of ideal body weight. 97. What is alveolar deadspace? It is the normal lung volume that has become unable to take part in gas exchange because of reduction or lack of pulmonary perfusion. 98. What is physiologic deadspace? It is the sum of anatomic and alveolar deadspace. It is approximately the same as anatomic deadspace. (1) Hypoventilation, (2) persistent V/Q mismatch, (3) persistent pulmonary shunt, (4) persistent diffusion defect, and (5) persistent reduction of PiO2 (inspired O2 tension). It is the reduction of alveolar ventilation and an increased PaCO2. 101. What are the causes of hypoventilation? Suppression of the CNS, neuromuscular disorders, and airway obstruction. 102. What is alveolar volume? 103. Describe minute alveolar ventilation? It is a function of tidal volume, deadspace volume, and respiratory rate. 104. What causes low minute alveolar ventilation? It is caused by hypoventilation and you will typically find an elevated PaCO2. 105. What is a V/Q mismatch? It is an abnormal distribution of ventilation and pulmonary blood flow and is responsible for the development of hypoxemia. It is readily reversible by oxygen therapy. 106. What causes a high V/Q mismatch? It is typically related to deadspace ventilation. 107. What causes a low V/Q mismatch? It is typically related to pulmonary shunting. 108. What causes intrapulmonary shunting? When pulmonary blood flow is in excess of ventilation, also known as wasted perfusion. 109. What are the different levels of a shunt? Normal = less than 10%; mild shunt = 10% to 20%; significant shunt = 20% to 30%; critical and severe shunt = greater than 30%. 110. What is the physiologic shunt equation? 111. What does CcO2 stand for? 112. What is the diffusion defect? A pathologic condition leading to impaired gas exchange through the alveolar-capillary membrane. 113. What is hypoxic hypoxia? It is the lack of oxygen in the organs and tissues due to a reduction in the inspired oxygen tension. Often time, patients with smoke inhalation are at risk. 114. What are three things that the gas diffusion rate can be affected by? (1) The thickness of the AC membrane, (2) The surface area of the AC membrane, and (3) The time available for diffusion to take place. 115. Hypoxemia is the lack of oxygen in what? 116. Hypoxia is the lack of oxygen in what? 117. What are the signs of hypoxia? Hypoxemia, dyspnea, tachypnea, tachycardia, cyanosis, and patients appear with shortness of breath and are disoriented. 118. What are the three groups of mechanical ventilation patients? (1) Depressed ventilatory drive (e.g. drug overdose), (2) excessive ventilatory workload (e.g. airflow obstruction), and (3) failure of ventilatory pump (e.g. chest trauma). It may lead to oxygenation and ventilatory failure. The patient may have normal pulmonary function, but respiratory muscles do not have adequate impulses to function properly. 120. What are the objectives of mechanical ventilation? To support or manipulate pulmonary gas exchange, to normalize alveolar ventilation, to maintain arterial oxygenation, and to reduce or manipulate the work of breathing. 121. What is volume controlled ventilation? It is volume limited, volume targeted and pressure variable. 122. What is Pressure Controlled ventilation? It is pressure limited, pressure targeted and volume variable. It is the mechanism by which the phase of breathing switches from inspiration to expiration. 124. How do you select the initial tidal volume for a patient on the mechanical ventilator? It should be set at 5-10 mL/kg of the patient’s ideal body weight. You can also use 5-8 mL/kg, but 5-10 is simpler and that what we always teach for the TMC Exam. Both will work to get you the correct answer. 125. What is the minimum Fi02 used in anesthesia? 126. Below what number should PIP be set at in order to avoid overdistention of the alveoli? Keep the PIP < 45 cm H20. 127. Below what number should the plateau pressure be set at in order to avoid overdistention of the alveoli? Keep the plateau pressure < 30 cm H20. 128. What is a normal I:E ratio? 129. What range of PEEP will improve the functional residual capacity and dilate alveolar gas space? 130. In spontaneous ventilation, the PEEP effect is achieved by the use of what? 131. During mechanical ventilation, what happens at the end of inspiration? The expiratory phase begins by opening the exhalation valve. 132. What is intraoperative alveolar recruitment? It is a method, essentially, for increasing the mean airway pressure. 133. What is mean airway pressure? It is the average airway pressure during the inspiratory cycle. 134. What is the purpose of increasing mean airway pressure? You would increase it in order to re-inflate collapsed alveoli and thus ultimately improving oxygenation. 135. Why is mean airway pressure clinically important? For any specific tidal volume, PaO2 can be affected by mean airway pressure & the parameters used to achieve this pressure. An increased mean airway pressure improves the FRC. Increasing the mean airway pressure improves oxygenation in patients with pulmonary disorders that are refractory to conventional ventilatory modes. 136. In what conditions is mean airway pressure important? ARDS, Pneumonia, Ventilatory induced lung injury, pulmonary contusion, Pulmonary edema, Morbid obesity, Any pulmonary condition, and when the patient is on general anesthesia for more than 4 hours. 137. What does barotrauma cause? Hyperinflation over a sustained period of time and large changes in volume. Remember, high peak airway pressures are not necessarily the cause of most barotrauma. Try to avoid plateau pressures > 30 cm H20. 138. What effect can positive pressure ventilation have on the central nervous system? It can cause an increased intracranial pressure. 139. What effect can positive pressure ventilation have on the cardiovascular system? It can cause a decrease in residual volume preload which leads to a decrease in cardiac output. 140. What is the most common reason for mechanical ventilation after anesthesia? Impaired respiratory drive secondary to the residual effects of anesthesia. So there you have it! By using this study guide with the absolute best practice questions concerning the principles of mechanical ventilation, you can use this knowledge to ace your tests in Respiratory Therapy school. Another good thing is that since you’ve already learned this information now, you will be able to use it when you take the TMC Exam as well. This, in turn, will help you develop into a great Respiratory Therapist before it’s all said and done. Thanks for reading and I’ll see you in the next post, and as always, breathe easy my friend.